Today I'll be posting about something other than FOSS game development, something far more important (yes, such a thing exists!). Today's topic is Freedom of Speech and how we never must take that for granted. I live in Sweden where the last couple of years there has been a couple of incidents where islamic fascists have tried through violence and threats of violence to impose their world view on other people. Central to that world view is an active aggression against the principle of Freedom of Speech which underpins our whole democratic and parliamentary system. The most prominent examples are the threats and active murder attempts on the Danish cartoonists who drew pictures of Muhammed, or the threats made against South Park. In Sweden the artist Lars Vilks has been both physically assaulted and subjected to arson as a result of his drawing of Muhammed in 2007. It's easy to take the Freedom of Speech for granted and to think that those people that want to bring it down only operate in chaotic countries such as Pakistan or Somalia. That is unfortunately not the case, as shown in this video of Lars Vilks presenting a lecture on the topic of "Art and Freedom of Speech". Vilks suffered some bruises and a broken pair of glasses. The day after someone tried to kill him by setting his home on fire. Do not be tempted to draw the conclusion from this video that Sweden, or any other European country is under any threat of "being overrun by Islam" or similar. That is absolutely not the case; it is in fact the opposite. When faced with a stable society and a high standard of living most people tend to distance themselves from religion and totalitarian ideologies, even if it might take a generation or two. But it does show that Freedom of Speech is something we never can take for granted, and not something we can barter with. It is the firmament on which our whole society is built on, and we cannot let fascist or totalitarian ideologies or groups make us infringe on it one iota. As long as people feel threatened by violence for expressing their opinions there is no real Freedom of Speech. For every Lars Vilks who has the guts to criticize Islam and as a consequence gets assaulted and beaten, there are thousands of other people who hold their tongue. Some of them in Western countries such as Sweden, but most of them in countries where Freedom of Speech already is curtailed, such as Iran or Pakistan. 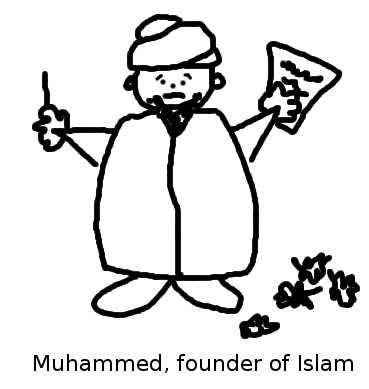 Therefore I'm today celebrating the annual Draw Muhammed Day by presenting my own drawing of Muhammed, the founder of Islam. By providing my own drawing of Muhammed I'm showing my support and solidarity with the artists currently under death threats. Note that the drawing is pretty tame (and badly drawn); I know this blog is syndicated so I'm putting a little restraint on myself. To more properly show my complete and total outrage of having islamic fascists trying to impose their warped totalitarian world view on me it would be more proper to show Muhammed being raped by a pack of dogs. But I'll wait with that picture for another day (not that the Internet is lacking in such depictions). Muhammed, shown here during one of his schizophrenic episodes trying to come up with another verse for the Qur'an.